At least 12 people were killed and 48 others injured when a truck plowed through a crowded market. Police investigate Berlin truck crash the atruck plowed into a crowd at a popular Christmas market in Germany’s capital Berlin on Monday . 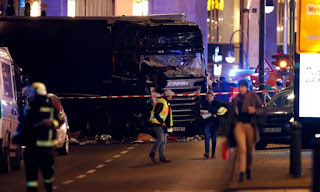 The driver intentionally plowed a truck into a crowded Christmas market in central Berlin Monday night,The truck veered into the market during one of the most crowded times, with people gathering in huts that sell food and Christmas goods. A passenger was among the dead in the crash at Breitscheidplatz, near the Kaiser Wilhelm Memorial Church in central Berlin . Witnesses said the truck did not appear to slow down as it drove through the crowded pedestrian area,however, there was no statement or confirmation from officials in Germany that the crash was a terrorist attack. No Comment to " truck crashes into Christmas market - Berlin "